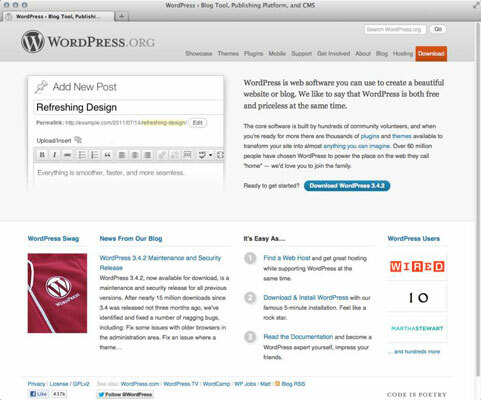 Using WordPress.org requires you to download the software from the WordPress website, and then you need to install it on a server from which your blog or website operates. The WordPress.org website is an excellent repository of tools and resources for you throughout the lifespan of your WordPress-powered blog, so be sure to bookmark it for future reference! Plugins: The Plugin page of the WordPress.org website houses a full directory of plugins available for WordPress. You can search for and find the plugins you need for SEO enhancement, comment management, and social media integration, among many others. 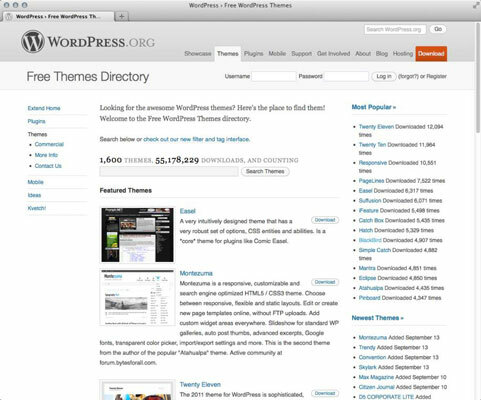 Themes: The Free Themes Directory page is a repository of WordPress themes free for the taking. In this section of the WordPress.org website, you can browse more than 1,500 themes to use on your site to dress up your content. Docs: Almost every piece of software released comes with documentation and user manuals. The Docs section of the WordPress.org website contains the WordPress Codex, which tries to help you answer questions about the use of WordPress and its various features and functions. Forums: The support forums at WordPress.org consist of WordPress users from all over with one goal — learning how to use WordPress to suit their particular needs. The support forums are very much a community of users (from beginners to advanced) helping other users, and you can generally obtain a solution to your WordPress needs here from other users of the software. WordPress.org is the self-installed, self-hosted software version of WordPress you install on a web server that you have set up on a domain you have registered. Unless you own your own web server, you need to lease one. Leasing space on a web server is web hosting, and unless you know someone who knows someone, hosting generally isn’t free. You also have full control of the core files and code that WordPress is built on. If you have a knack for PHP and knowledge of MySQL, you can work within the code to make changes that you think would be good for you and your blog. You don’t need design or coding ability to make your blog look great. Members of the WordPress community have created more than 1,600 WordPress themes (designs), and you can download them free and install them on your WordPress blog. Additionally, if you’re creatively inclined, like to create designs on your own, and know Cascading Style Sheets (CSS), you have full access to the template system within WordPress and can create your own custom themes.